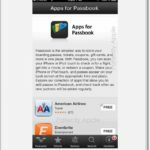 How could Apple become and remain the world’s most profitable company? Well, that’s an open secret, thanks to Apple’s quarterly earnings call and Asymco’s Horace Dediu, who posted a fresh analysis on his blog taking Apple product’s gross margins under his loop. According to Dediu, Apple’s decision to move towards mobile devices has pushed its gross margins and operating margins upwards since 2006. While Mac computers had decent margins, they turned out to be not as profitable as other mobile devices such as the iPhone, iPad or iPod. 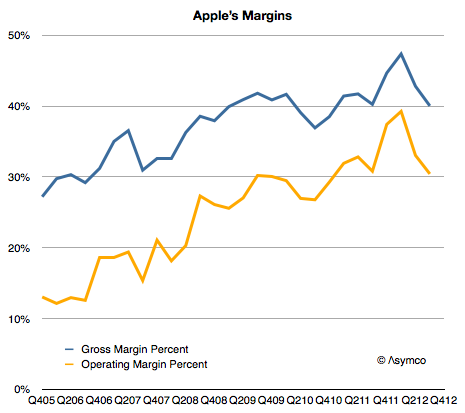 As Dediu’s previous reports already pointed out, the iPhone has produced the highest margin for Apple, a huge 50%. As this graph shows, it is the only product able to produce a consistent 50%, while the iPad produces only 35%. The rest of Apple’s products have been at or below 30% since 2009. 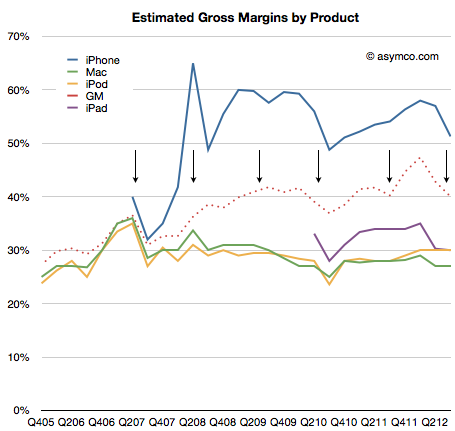 However, the iPhone has had its dips in gross margins, caused by new version launches. Horace Dediu explains the above chart.